With a whopping whoosh of air from nostrils the size of dinner serving platters, the benign giant of the seas announces its presence with a hearty blow. Several rolls and exhalations later, the humpback whale sounds, its 15-foot-wide tail signaling its disappearance into the deeps for the next few minutes. There’s nothing subtle about humpback whales, and with every move they prove themselves creatures of grace and power. To the delight of cruise ship passengers and small-boat travelers, the sight of a humpback is unforgettable. Once a photographer finds these marine mammals, they make for easy photo ops; no mountain climbing or swamp-slogging is required, so heavy lenses are welcome. The downside is that the ocean’s a big place; you can travel for hours or even days without a whale sighting, even in prime whale waters. Whale sightings happen most frequently in the island-buffered waters of Alaska’s Inside Passage and Prince William Sound, where fortunately, boat bouncing and seasickness are minimal. Hundreds of humpbacks, each weighing up to 50 tons, converge on Alaska from April to September after a spending a winter in the clear waters of Hawaii. From Hawaii they travel north for thousands of miles—one of the longest migrations of any mammal—for a months-long feast. In Hawaii they mate, females birth calves, males sing their compelling songs and they don’t eat the whole time they’re there. In Alaska they sing little but eat—often half a ton per day—around the clock. Researchers track individuals by noting tail (fluke) patterns. Like human fingerprints, no two flukes are the same. They feast, not on monster fish as one might expect, but on tiny krill (shrimp-like creatures) and capelin (a small species of fish). Alaska is the perfect “krill factory;” nearby glaciers grind down mountains and flush minerals to the sea. Phytoplankton (plant plankton) thrives on the minerals and flourishes during the long summer days. Zooplankton in turn consumes the phytoplankton, the krill eats the zooplankton, fish take a turn, and finally whales top the food chain by gathering great gulps of krill-filled seawater and straining the water out through their baleen. Specific places in Alaska with ideal ocean currents make for concentrations of krill, and where krill thrives, whales follow. 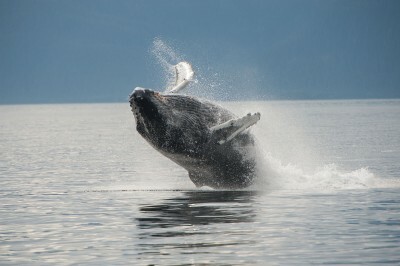 Although humpbacks wander the world’s oceans, in Alaska humpbacks are particularly abundant in Frederick Sound, Point Adolphus (on the south shore of Icy Strait near Glacier Bay), Auke Bay near Juneau, Kenai Fjords near Seward, and western Prince William Sound, east of Anchorage. The greatest numbers occur in vast Frederick Sound and neighboring smaller bodies of water, where about 500 animals linger each summer. In addition to humpbacks, orcas roam these coastal waters, although they are not quite as common as humpbacks. Typically, humpbacks travel alone or in small groups of two or three. Often, a calf follows close to Mom for protection against hungry orcas, their only enemies. The babies can’t dive as deeply or for long periods, so you’ll see them on the surface more often. Like any child, a humpback calf can be frisky, making for exciting photo ops. Occasionally a calf will come close to a boat, perhaps curious about human faces. A few generations ago, seeing any kind of whale was a rare event. Humpback whales, once prized for their meat and oil, were hunted to the brink of extinction before a hunting moratorium was introduced in 1966. The proliferation of whales today is a testament to the many conservationists who made these protections happen. Although humpbacks—named for the arching of their backs as they dive—project a relaxed demeanor most of the time, they are famous for their pyrotechnics. Yes, they lobtail (repeatedly hitting the water with their tails) and loll on their backs to slap the water with their light-colored pectoral (side) fins that can be up to 15 feet long, but they’re best-known for breaching—jumping partially or completely out of the water. No one knows exactly when or where this might happen, so getting a photograph of a breach is kind of like winning the lottery. The first indication of breaching activity might be a huge white splash miles away, or a sound like a cannon firing, the boom caused by a whale belly flop. Why do they breach? No one knows. Perhaps they are trying to slough off barnacles, or maybe they’re just having fun. Sometimes they will breach just once (one theory has it that this is a proclamation of territory), and other times they will jump 20 or 30 times in a row. In a breach series, they are the most energetic during the first few breaches, when with luck you will see them soaring completely out of the water. Any whale photography, especially breaching, falls under the category of action photography, so you’ll have better luck with high shutter speeds, fast-focus lenses and cameras with fast frames-per-second capabilities. For any whale photography and especially for breaches, some prefocusing on a wave where you hope the whale will appear will save precious milli-seconds. Long lenses (300mm and bigger) are essential, both because of the unpredictable location of the next breach and also because boats are not permitted to approach closer than 100 yards, although the whales often choose to come closer. Use a boat railing or a monopod for stability and also for taking the weight of camera and big lens off your shoulders, as whale photography typically includes a prolonged vigil. And keep that camera strap around your neck, as an unexpected lurch of the boat could bounce your unsecured gear from your hands into the deep. Even more dramatic than breaching is a jaw-dropping, choreographed event called bubble-net feeding, where the prey are tiny species of fish, including capelin. In Alaska scientists first observed this cooperative feeding phenomenon in Frederick Sound in the 1970s. Although observers have seen bubble-net feeding all over the world, this whale behavior is most common in Alaskan waters. Here’s how it works: an alpha female finds the school of fish and sends a song out to other whales inviting them to dinner. Several to 20 animals gather for the big party. Together they spew an underwater ring of bubbles, “herding” the fish into a confused huddle. The female dives deeply, swims under the fish, pushing them up to the surface through the center of the net/ring, and the whales converge on the feast. They sometimes perform this sequence repeatedly for hours. The first hint that bubble-net feeding is about to occur is the sighting on the surface of the water of a ring of bubbles, perhaps 50 to 100 feet across. Then come the whales, which, like a convergence of eighteen-wheelers, often lunge halfway out of the water all at once as they leap up into the food, disarticulated jaws sometimes open more than 90 degrees and lower pleated jaws distended bullfrog-style. Next, they slam those huge jaws shut, expel the water through baleen filters by constricting their throats, and then mill about enjoying their mega-mouthfuls of food, often exhaling with gusto embellished by foghorn sound effects. Individual whales often do a modified version of bubble net feeding, feasting on slow-moving krill. They will side lunge as they come to the surface for the krill. As a photographer, one can try several vantage points: a low angle near the surface of the water for a profile view of the whales, or high on an upper deck for an overview. Again, a telephoto lens works best, but occasionally the whales will bubble-net feed right next to a boat, and a wide angle lens can capture the whole scene. Coastal Alaska is a wet region, and on a typical overcast day, whales and water will appear as nuances of gray. Fast lenses or cranking up your ISO can help assure higher shutter speeds and hence crisp images in the dimmer light. The overcast actually may be preferable to sunny weather, when contrast can be an issue. The white underbellies and pectoral fins of the whales can make for exposure problems. In addition, if the whale is cruising close to a dark shore, the shore reflection on the water can appear almost black and by comparison, the whales light gray. Conversely, against a light sky and light-colored ocean, you’ll get a whale silhouette. Exposure compensation along with shooting Camera RAW (ACR) can alleviate these exposure challenges. Rain protection for your camera gear is essential. Options range from humble kitchen garbage bags or grocery store produce bags (make a small tear opposite the bag opening, stretch it over your lens hood, secure with a rubber band and use the original bag opening for peering at the back of your camera) to sophisticated fitted camera rain gear that can last for years. Protect yourself, too; consider using good-quality rubber boots and two-piece rain suits. Summer temperatures are typically in the 50s and 60s F., so cold-weather gear is seldom necessary unless the wind comes up, and then hat, gloves and jacket come in handy. How do you get to the whales? Although you might see whales from a cruise ship or Alaska state ferry, these large ships won’t linger for whale watching. Fortunately, small-ship cruise companies and knowledgeable local outfitters offer adventures that may include quality time up close with these gentle giants. Take a look at the accompanying list for some options. So enjoy amazing moments with some of the largest animals on our planet. There are other places to see whales in the United States, notably Monterey Bay and the Maine coast, but in Alaska even if the whales are a no-show, you have the bonus of photographing some of the most spectacular scenery in the world.